Brunch will never be the same. Long gone are the days where we squandered our mortgage money on smashed avo (last Tuesday, to be precise), and we’re ditching the millennial tagline to embrace our own line of gourmet eats – made right at home! 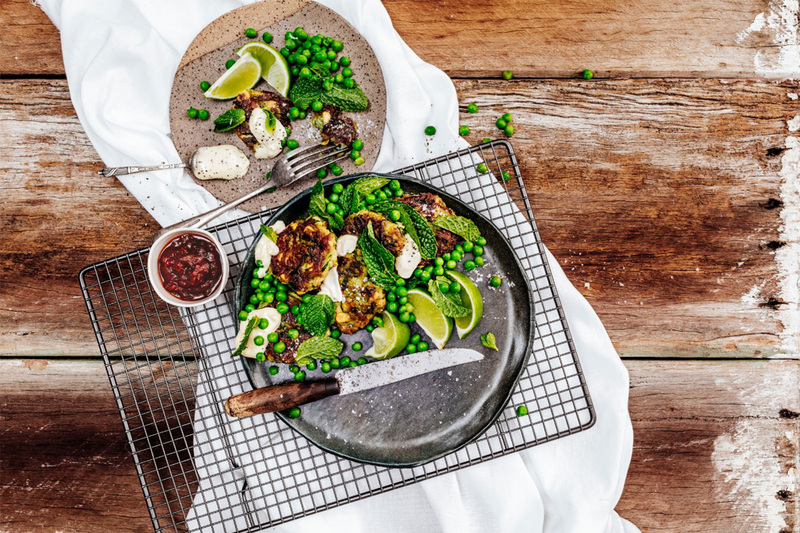 While our cooking repertoire is somewhat rusty, Roza’s Gourmet is making our lives easier with their delectable recipe for breakfast fritters – and if we can make them, anyone can. In a bowl, sprinkle the salt on the zucchini, mix through and set aside for half an hour. Then rinse salt from zucchini, squeeze excess liquid out and discard. Mix zucchini with the rest of the ingredients and set aside. Heat oil in a frying pan and dollop spoons of fritter batter into the pan, cook in batches for 2 – 3 minutes either side, taking care not to burn. Once cooked, drain on kitchen paper and set aside. In a saucepan with a dash of oil, add the garlic to sauté for a minute, or until aromatic, but not burned. Add stock and simmer. Season to taste. Whisk butter through the sauce and turn off the heat. Gently fold in peas, coating well and allowing them to warm a little. Fold mint through and serve alongside fritters. Mint wilts and becomes unpleasant when too much heat is applied, so don’t worry that the mint isn’t cooked, it will taste better this way. Garnish with plenty of Tomato Chutney and Hollandaise and serve immediately. This recipe was created by Roza’s Gourmet, a Brisbane based, family run business that lovingly creates an extensive range of gourmet sauces, dips and soups. The range of gluten free gourmet products are available in premium boutique retailers Australia-wide. To find out where to buy, check the stockists here. - The gourmand who only cooks when it's super necessary - like when she sees a Roza's recipe.